Rated 5 out of 5 by pennmom36 from There's A Rainbow Of Color In Every Puzzle Have you ever been so engrossed in the one hour trial demo of a game that you are surprised by the sudden and abrupt ending to the demo? (and have you noticed it always ends when you are almost finished with your puzzle) Well, that's how I felt when this game ended and I scrambled to hit the "buy now" button so I could get back to the solid entertainment this game provides. I will also admit that I rarely purchase Griddler games outside of my favorite series with Mr. Penguin, so mums the word on this one, lol! 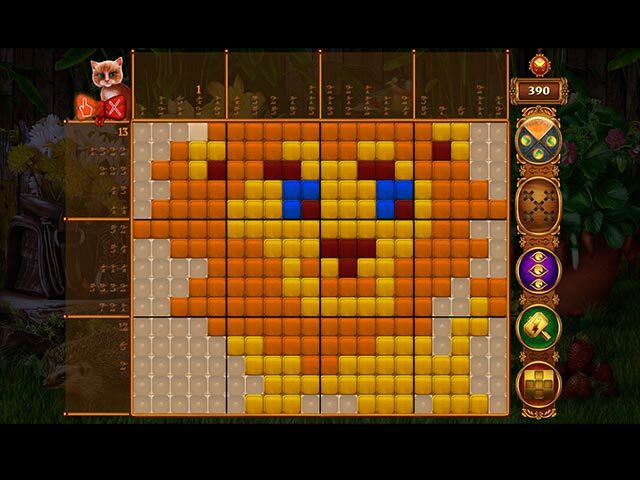 This is the third installment of Rainbow Mosaics, and they are quickly becoming my favorite griddler go to game. There's somewhat of a story as you join Cate who is helping her grandmother restore her garden for the upcoming garden event. In a Mosaic griddler game I don't really care much about the storyline, I just want to be challenged somewhat, and I want bright colors that form a picture a can actually recognize. 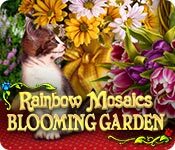 Rainbow Mosaics delivered all that and more, and even gives me the option to choose from several different types of filled cells, my favorite was the lego style,but there are 7 different styles of cells to choose from. There are 3 types of bonuses available, the Hammer allows you to open a cell of your choice, the Eye Power opens a random right square of cells and the Grid opens a chosen area without negative outcomes. You can earn up to 3 gold stars for the usual goals of finishing the grid without hints or more than one mistake. Each filled in cell will earn you coins or bonuses that can be used to purchase upgrades of each power-up, or you can decorate Grandma's garden gazebos, flowers and various plants. 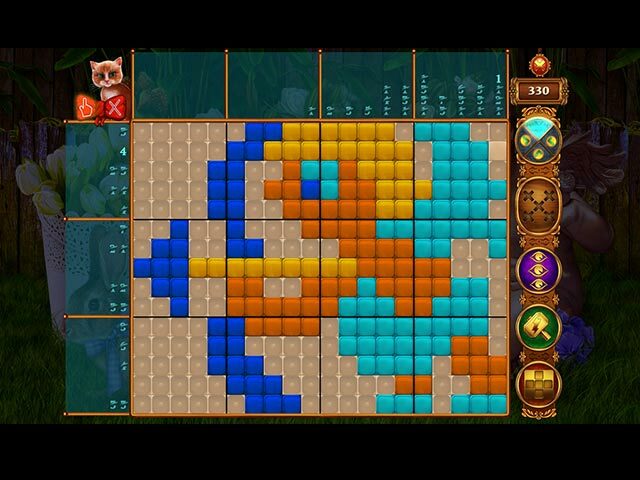 There are Trophies to earn as well, but I just enjoy the relaxation I receive when playing a good mosaic griddler game where each puzzle is just a tad bit more challenging than the previous one. Now that my game has finished downloading I'm ready to finish the grid I almost accomplished before the trial ended, enjoy! Rated 4 out of 5 by katbeth01 from Easy going game I really enjoyed this game. It was relaxing and easy going. I will definitely be checking out the other titles in this series. Rated 3 out of 5 by rheashard2 from Hard to get all the awards I have played the other Rainbow Mosaic versions. That influenced why I got this. It is pretty good. I liked the combination of easy to difficult mosaics. I have one complaint. 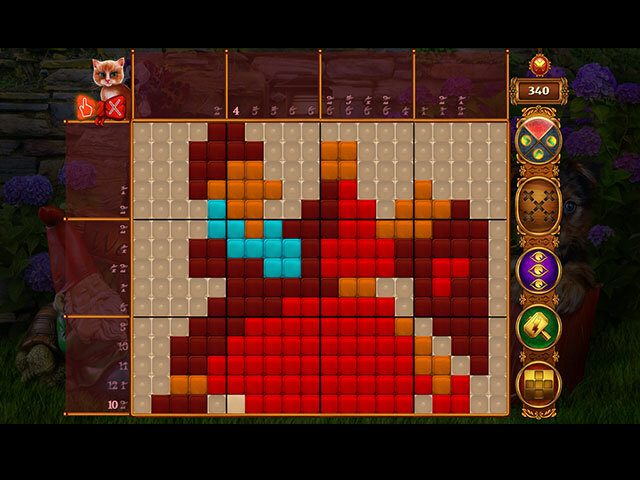 It is hard to get all the awards without replaying mosaics from the map. Coins are not earned by replaying mosaics from the done page. I completed puzzle with 3 stars for everything. Yet I did not earn the 20K award. I also did not get the award for purchasing all the in game aids. I feel that getting 3 stars for all should have been sufficient for getting the needed coins. Rated 3 out of 5 by chunkychow from Please give suggestions with this problem Mosaics are about the only games I play so I know what I am doing. Having trouble with the mechanics of this game. When I touch the squares, the ones next to that one will "X" itself and that will count as a mistake. I am using a touch screen. Could that be the problem. Any suggestions will be helpful - never had this problem with Penguin.